AllerMates brings customizable charm to our new multi-allergy alert wristband and a great way to remind others of your childs allergies or other health concerns. Up to 6 different characters can be added by pushing the flexible back through any hole in the band. Charms are secure and comfortable in place, but can be removed or moved if your child outgrows an allergy/health concern. AllerMates charms are great for other uses too, and will fit in popular shoes and accessories. Not a toy. Not intended for children under 3 years of age.- Charm measures 7/8th of an inch height (2 cm) and 1 1/5 cm (17 mm) wide. – Meets and exceeds US and European Safety Standards. 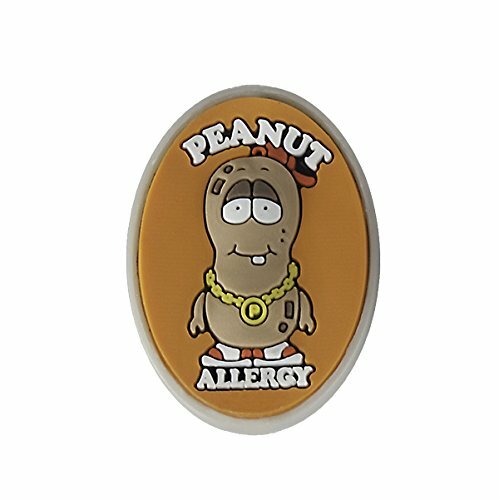 AllerMates brings customizable charm to our new multi-allergy alert wristband and a great way to remind others of your childs allergies or other health concerns. Add up to 6 different characters to our Allermates Allergy Wristband (sold separately, see our other listing for bracelet) by simply pushing the flexible back through any hole in the band. Charms are secure and comfortable in place, but can be removed or moved if your child outgrows an allergy/health concern. AllerMates charms are great for other uses too, such as shoe laces and other accessories. Meets and exceeds US and European Safety Standards.